That is not wasabi. 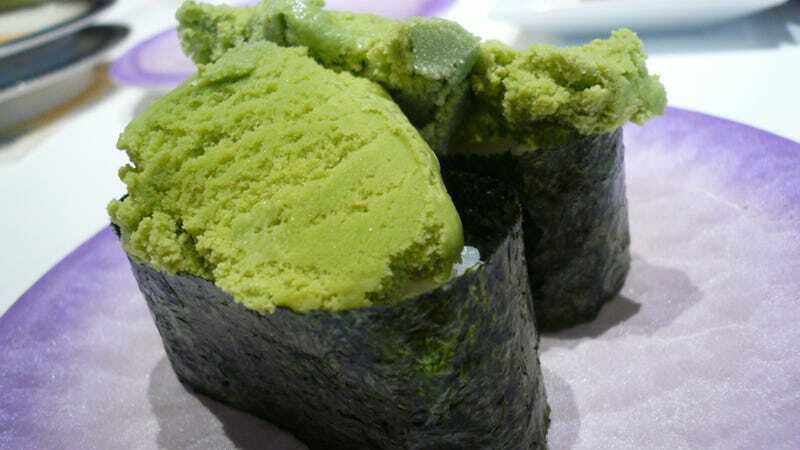 You are looking at green tea ice cream...sushi. No, really. That's vinegared sushi rice (aka "sumeshi" or 酢飯), dried seaweed ("nori" or 海苔), and ice cream. The ice cream sushi is served "gunkan maki" (軍艦巻) or "battleship roll sushi" style. This week on Twitter via Byoukan Sunday, photos of ice cream sushi appeared online. It seems a sushi chain in Kyushu called Uokura offers vanilla and green tea ice cream sushi for 160 yen (about $1.60) a plate. On the menu, it's even located between traditional sushi like "uni" (sea urchin roe) and "negitoro" (tuna and green onions). Most people online could not believe that ice cream sushi actually exists. It's somewhat baffling! Ice cream is traditionally served at conveyor belt sushi restaurants. Those chain restaurants are relatively inexpensive and frequented by families. Little kids often want ice cream for desert—thus, frozen treats. However, the ice cream is usually served in bowls (see above) and not as sushi. This is highly peculiar for Japanese people, too. That being said, this is still rather uncommon! So how does ice cream sushi taste? The reaction seems to vary from "pretty bad" to "better than you'd think". Nintendo fan site Segment Games recently sampled the ice cream sushi, writing, "When I timidly tried ice cream sushi, surprisingly, it was perhaps not so bad." The site added that the green tea ice cream flavor was followed by the taste of vinegared rice and that you couldn't really taste the nori. Oh. If Japan has seen chocolate banana sushi, then why not ice cream sushi? You certainly won't be able to order this at most sushi restaurants in Japan, but if you are feeling adventurous, you can always make your own.